FORT SUMNER -- A Fort Sumner man was sentenced to 57 days in jail and ordered to pay $2,225 in fines and court costs after he pleaded guilty to five wildlife-related charges, including the poaching of a near state-record white-tailed deer. Loy Minton, 25, originally was charged with 16 wildlife-related crimes stemming from an investigation into deer poaching in the Fort Sumner Valley. Minton has been in jail since Jan. 27, when a search warrant was served at his house. DeBaca County Magistrate Buddy Hall accepted an agreement in which Minton pleaded guilty to three counts of unlawful possession of deer and two counts of unlawful killing of deer. Minton forfeited the rifle used in the crimes and faces another 350 days in jail for probation violations. Minton also faces civil penalties to reimburse the state of New Mexico for the loss of the deer. 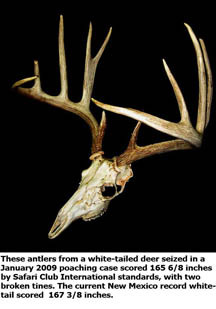 Three of the bucks, one white-tailed and two mule deer, exceed the minimum requirements for increased civil penalties. Those penalties could be as high as $16,000 due to the trophy quality of the three bucks. The white-tail would have been a new state record except for two broken antler tines. Anyone with information about any wildlife crime in New Mexico is urged to call Operation Game Thief at 1-800-432-GAME (4263). Callers need not identify themselves or testify in court, and may be eligible for rewards.